By Christine Amorose | November 12, 2018 | This post may contain affiliate links, which means we may receive a small commission, at no cost to you, if you make a purchase through a link. Read our Disclosure. New York City has one of the, if not the most iconic skylines in the world – all of those famous skyscrapers crowded into one tiny island. 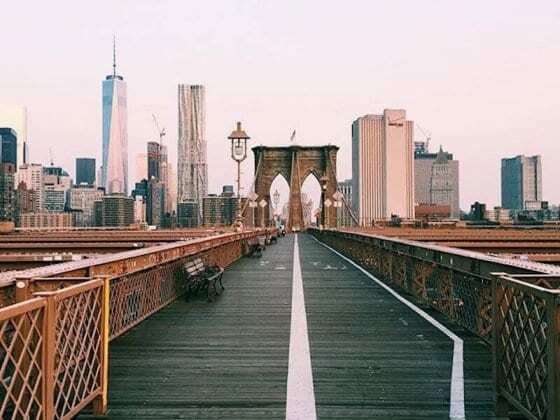 There are countless places to take awesome photos on street level in Manhattan and endless perspectives of the city that never sleeps, but these are a few of my favorite places to get stunning NYC views from all around the Big Apple. Need more tips for NYC? If you splurge on one view from above, Top of the Rock is my recommendation. It’s located squarely between the Empire State Building and Central Park, and the 70th floor offers an excellent perspective on both. To avoid lines at Top of the Rock (or the Empire State Building or One World Observatory), buy a timed ticket online in advance of your visit. It’s the most famous skyscraper in the New York City skyline, and because of that, the view from the 102nd floor of the Empire State Building can almost seem a bit eerie – the 360-degree views all seem to be missing an important piece. That said, it’s an incredible place to watch the sunset or escape from the chaotic streets below. 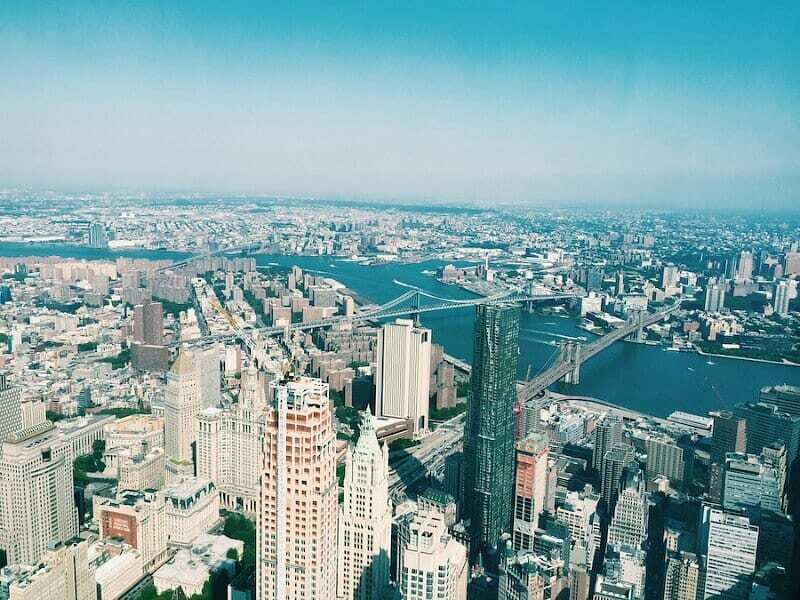 The newest addition to the skyscraper observatories, One World Observatory is located at the top of the tallest building in the Western Hemisphere. Although it’s all indoor (you might struggle with fingerprints or flash bounces on the glass if you’re taking photos), it offers a stunning view of Lower Manhattan and beyond, especially the Brooklyn Bridge and the Statue of Liberty. The Roosevelt tramway is one of my favorite (cheap) views in the city, and it might be just because not many people know about it. Roosevelt Island was originally known as Welfare Island, since it housed many hospitals – including a smallpox hospital, whose ruins can still be seen. Now it’s home to a lot of construction and some much-needed open green space, and you can access it via subway OR a tram that goes over the East River. It costs $2.75 to ride (free if you have an unlimited MetroCard) and it gives an awesome perspective of Upper East Side streets, the traffic on the Queensboro bridge and a peek at the Chrysler Building. 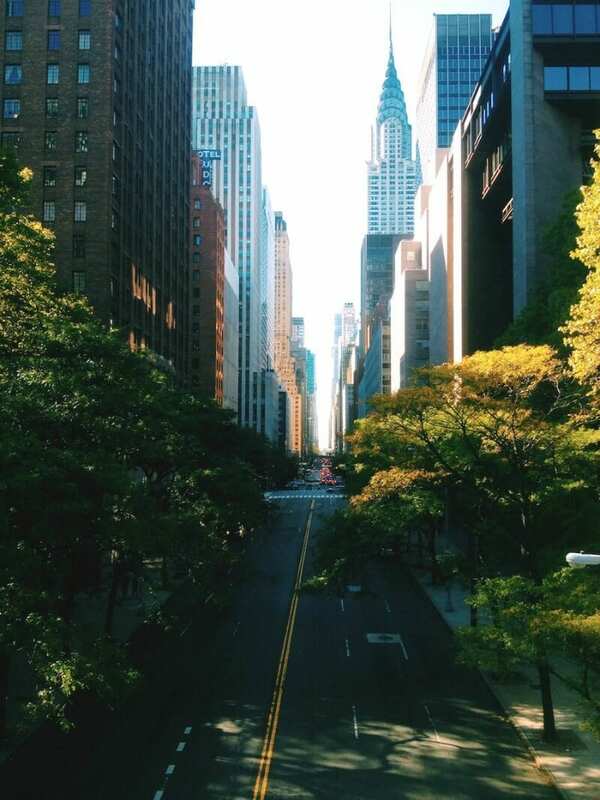 For a neat perspective of the Manhattan grid, head to Tudor City on the far East Side: the quiet collection of stately apartment buildings and tree-lined squares has a lovely overlook on 42nd Street. 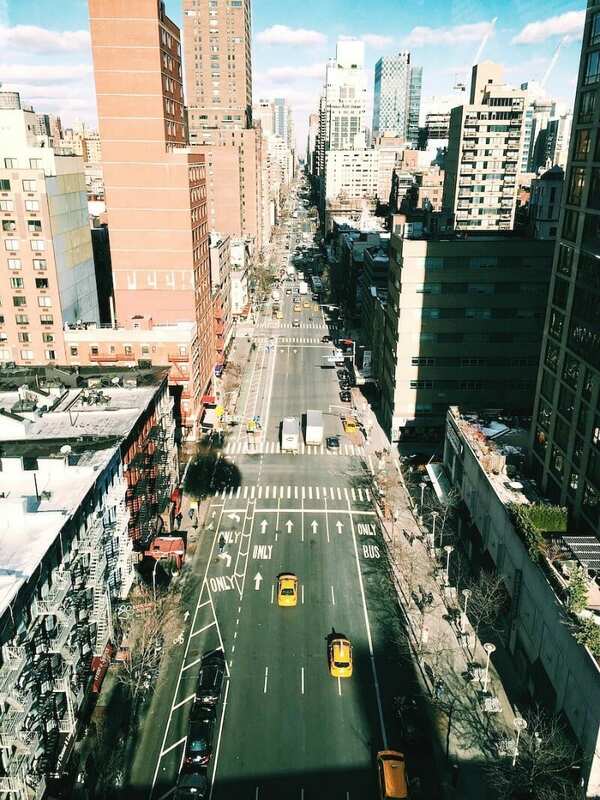 It’s especially famed during Manhattan-henge, when the sunset aligns perfectly with the east-west streets. Bonus: a very good cameo by the gorgeous Chrysler Building! 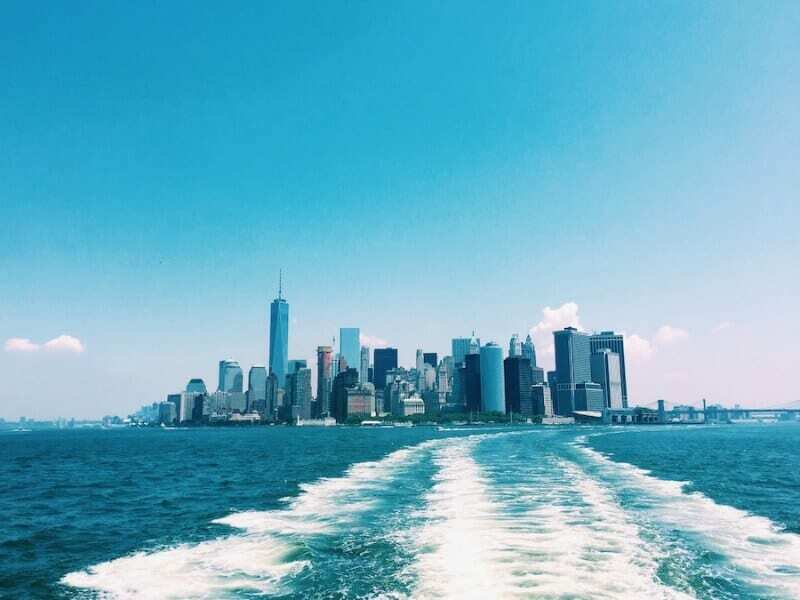 The Staten Island ferry is 100% free, and it’s worth checking out if you’re visiting Manhattan on a budget – it offers a killer view of the Financial District office buildings, including One World Trade. It also goes right by the Statue of Liberty! It’s a great alternative to the awesome but more expensive boat excursions, like a sunset sail or Circle Line tour. 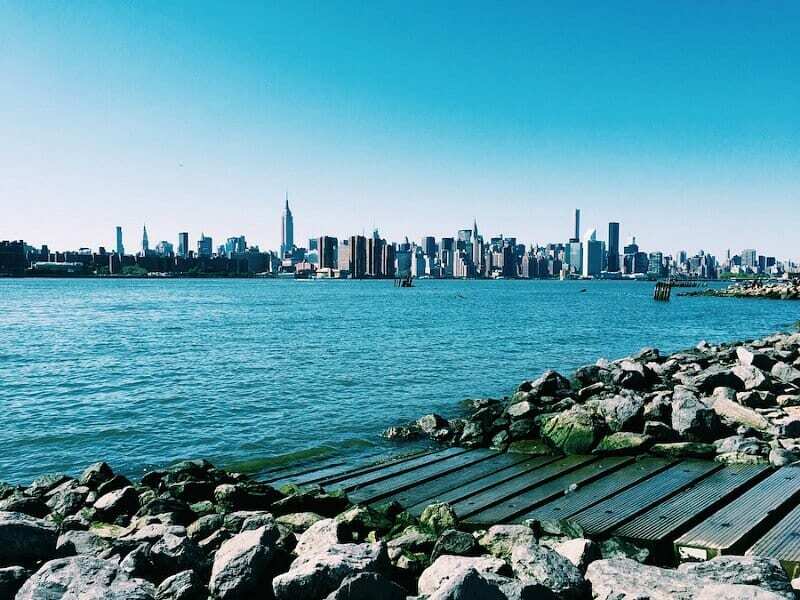 One of the best ways to get a great view of Manhattan is to leave it: going across the river to New Jersey or Brooklyn offers perspective on just how many skyscrapers are crammed into one tiny island. I especially love the viewpoint from East River State Park: there’s a teeny-tiny sandbank where teeny-tiny waves break, and it almost feels like you’re at the beach and not in between the two boroughs. One of the best NYC views looking up! 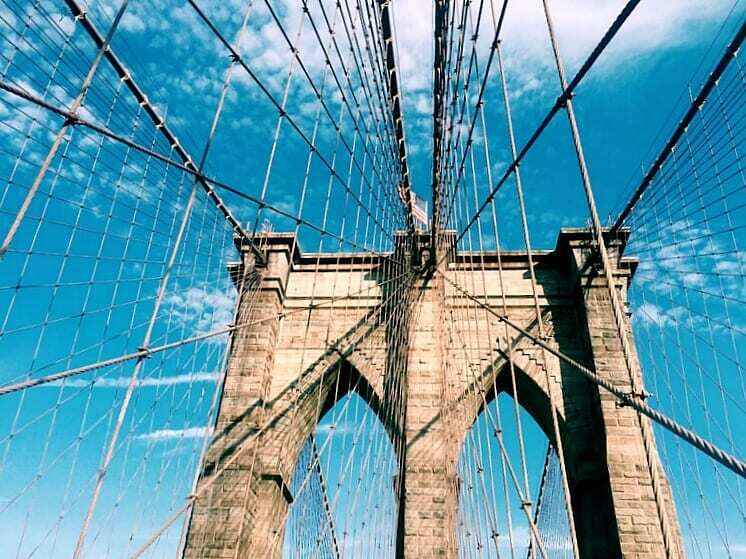 The Brooklyn Bridge is one of those can’t-miss activities on most NYC itineraries, and it doesn’t disappoint. It’s best to go early if you want to avoid crowds, but it’s also one of the most special places to see the sun set in the city (especially with the Statue of Liberty in the distance). I love the view when you look up as you actually walk across the bridge, but you can also get a great perspective from Brooklyn Bridge Park on the Brooklyn side. 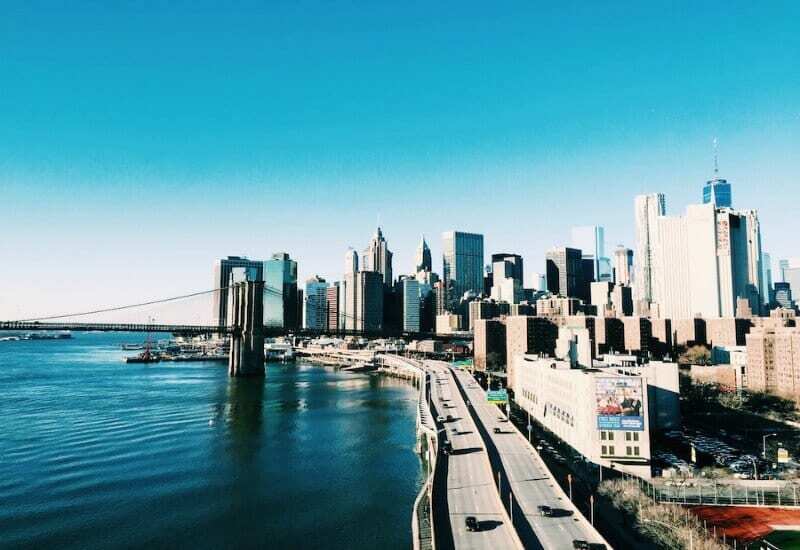 Just like you get the best view of Manhattan from Brooklyn, I think you get the coolest view of the Brooklyn Bridge from the Manhattan Bridge. The pedestrian walkway offers a cool perspective of the FDR freeway and the bridge spanning to connect DUMBO and FiDi. Another excellent place to see the sunset! 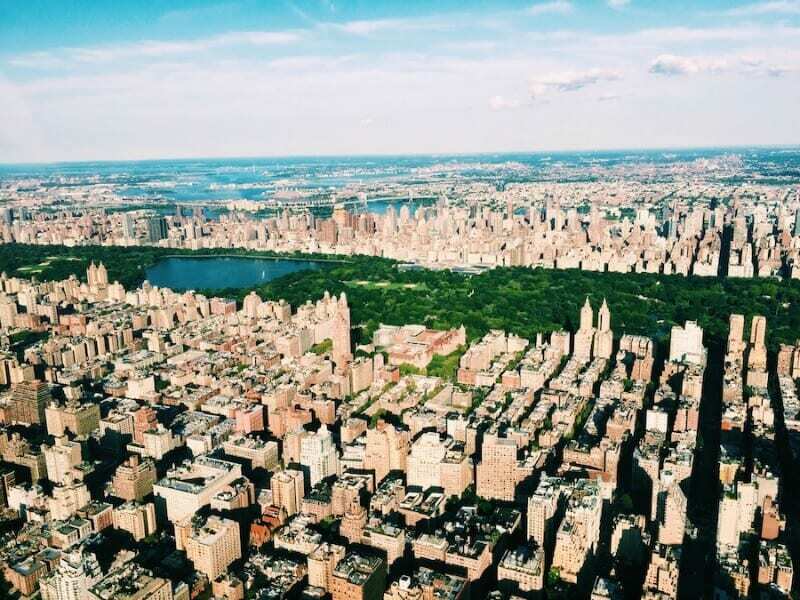 It’s not cheap, but if you’re up for a splurge a helicopter ride over Manhattan is one of the most incredible experiences. The tours don’t last long – usually only about 15 minutes – but it’s such a cool thing to have a birds-eye perspective on even the tallest skyscrapers in this hemisphere. Go later in the day for gorgeous golden hour lighting! Check out Airbnb rentals here. 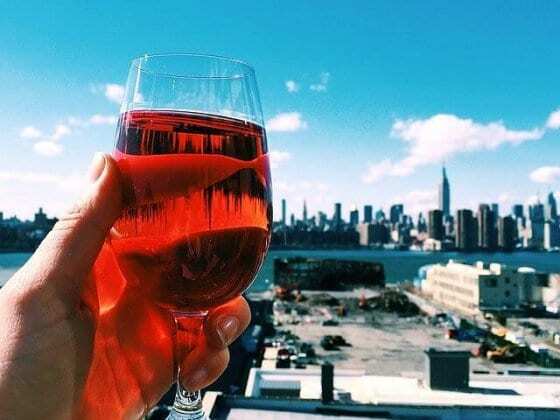 Do you have tips on where to get great NYC views? Please share in the comments below. 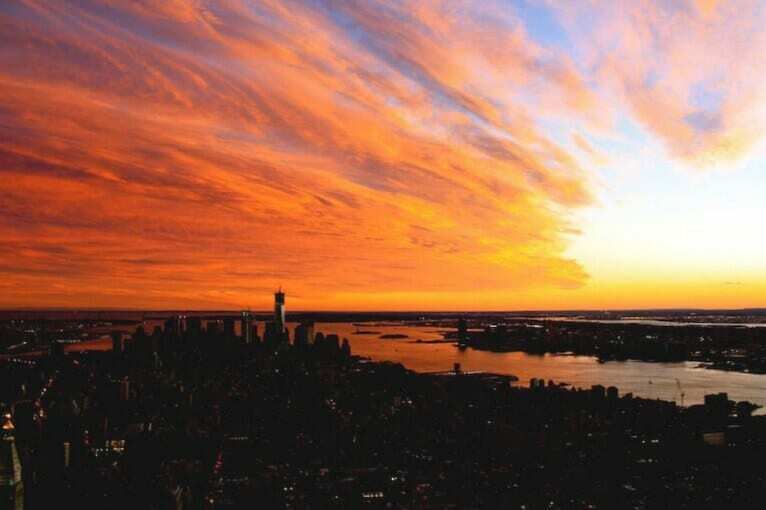 That sunset photo from the Empire State – WOW! That would be one amazing site. Great views of the city all around. Wow Amazing views!! 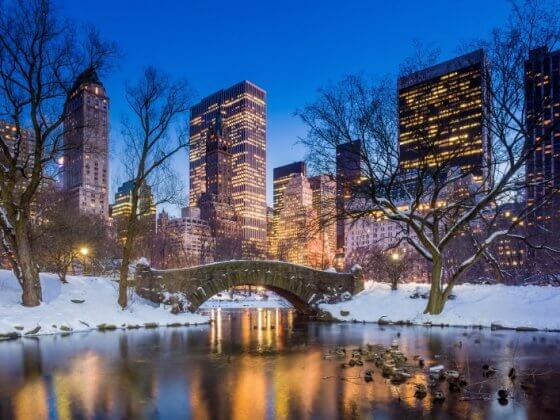 It would like to bookmark this post… Really amazing pictures of NYC…. Great timing, we are living in a few days for NYC! Luckily most of these were already on our list because we are running out of places to put things in our itinerary! Wow great! I have done most of them, but not the One World observatory. And that view from the Empire State Building used to be the view from my office! Best office ever! Incredible photos. I enjoyed a lot. Forcing me to plan my next trip to NYC. Thanks. 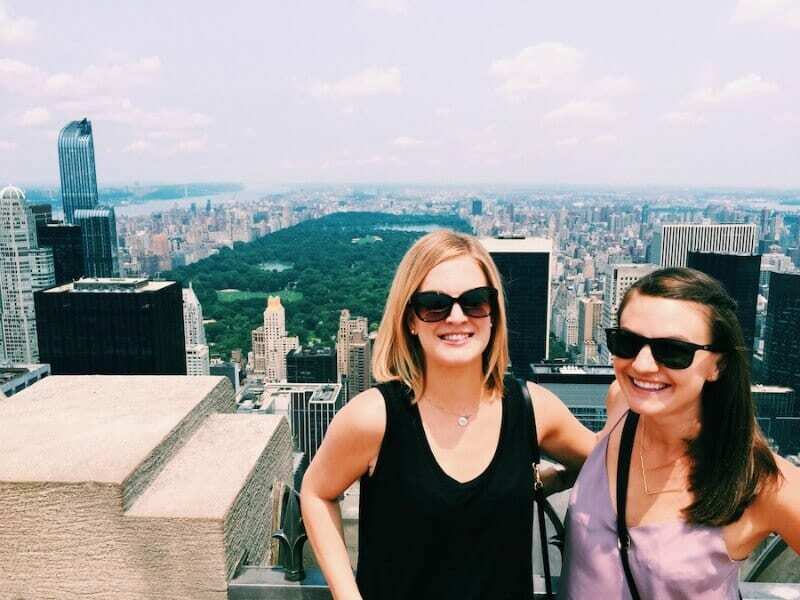 Totally agree with you on Rockefeller Center having the best view of the city! But my favourite happens to be from Staten Island Ferry. To see those iconic buildings against the bright blue sky fills me with awe, every single time! Great article and mindblowing pictures.